I do believe that good eating habits need to be inculcated as kids, and in case you have brats like I was, you feed them healthy ingredients, without their knowledge. But coming back to this post, it’s an Antioxidant Punch. 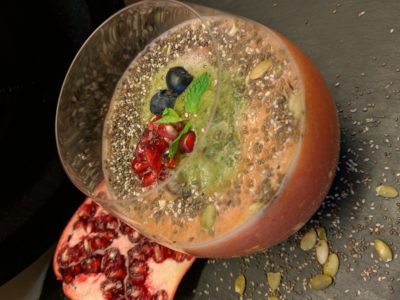 I prefer to blend my ingredients than juice them because essentially the fibre present in the veggies and fruits is one of the most important elements in food and juicing knocks them off, but juicing does make the juice nutrient rich. To differentiate between the two, blended juices are called smoothies and you can add many more ingredients to them. Blending also makes the smoothie robust and keeps you full for longer, making it ideal for breakfast. I also do not add any ice or sugar to my smoothies. Makes no sense watering it down, right? Blend each fruit separately and then pour into a glass. Muddle the mint with a bit of lemon juice, to keep its colour and pour on top of the juices. Add chia seeds all around the mint leaves and dress with a few pomegranate pearls. CARROTS are rich in vitamin A, minerals, fibre and antioxidants, which help reduce the risks of cancer and cardiovascular disease. POMEGRANATES are rich in vitamin C, potassium, antioxidants and fibre. It prevents dental plaque and reduces blood pressure. ORANGES are rich in vitamin C, they improve blood circulation, reduce the risk of stroke and boost the immune system. CHIA SEEDS are a good source of omega-3 fatty acids, iron, fibre, antioxidants and calcium. MINT leaves help in memory retention and alertness. It is also a natural stimulant. This is going to be yet another great jhealthy journey.